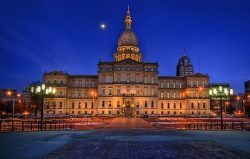 Lansing, MI is the capital of Michigan, it is referred to as L-town, Capital City, or “The Heart of Michigan.” The capital city offers unique attractions including, the state capital building, The Impression 5 Science Center with interactive displays, the R.E. Olds Transportation Museum including classic and contemporary Oldsmobile cars, and the Potter Park Zoo that houses endangered and threatened species. Each year in August, the Michigan Pride festival includes an LGBT pride parade from Riverfront Park to the capitol. The Capital City African American Cultural Association hosts an African American Parade and Heritage Festival every year for over a decade. The annual Silver Bells in the City Electric Light Parade proceeds through the streets of downtown Lansing every November, the Friday before Thanksgiving. It is followed by the lighting of Michigan’s official Christmas tree in front of the State Capitol and a firework show (weather permitting) over the State Capitol. The Lansing Jazz Fest and the Oldtown Blues Fest host leading musicians, and are two of the larger music festivals held each year in the state. Old Town’s Festival of the Moon and Sun is a two-day festival of food and live music. Old Town Oktoberfest is a two-day event drawing hundreds to the Old Town neighborhood for live polka music, authentic German food, and world-renowned German-style beer. Howl2GO is the perfect entertainment for Lansing’s numerous festivals and entertainment options. Howl at the Moon is the country’s biggest name in Dueling Piano entertainment. Howl2GO delivers our amazing, high energy show to any venue in the Lansing area. 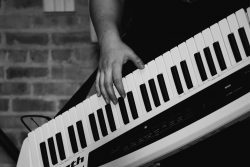 When you bring Howl2GO to Lansing, you can be certain you’re getting the true Howl at the Moon experience, and with that comes the assurance you are booking only the best dueling piano performers in the country. Our fun, energetic performers are perfect for all events anywhere in the Lansing area. We specialize in all types of events, anywhere in the Lansing area – company parties, wedding receptions, charity fundraisers or house parties are all made more fun by bringing Howl2GO by Howl at the Moon. We tailor every single show to you and your guests, playing music for all ages. Fundraising for churches, schools or your chosen cause is perfect for our show – plus advertising that you have Howl at the Moon performing is a huge draw in the Lansing community. Dueling Pianos in Lansing is all we do! Howl2GO has a dedicated team of professionals on staff. From our sales manager who will help build out your vision, our production team who will communicate with your venue in Lansing, a wedding specialist and, of course, our world-class entertainers, picked specifically for your event. We only bring Howl at the Moon trained musicians, all of whom have experience playing at one of our locations nationwide. We are a perfect choice for your wedding – we keep numerous couples in Lansing and their guests dancing all night, as well as taking care of all your ceremony, announcements and special family dance needs. Don’t risk booking a local fly-by-night company that may not even still be in business when your wedding date comes around, nor one that hires freelance players. Howl at the Moon has been rocking since 1990 and our reputation precedes us.